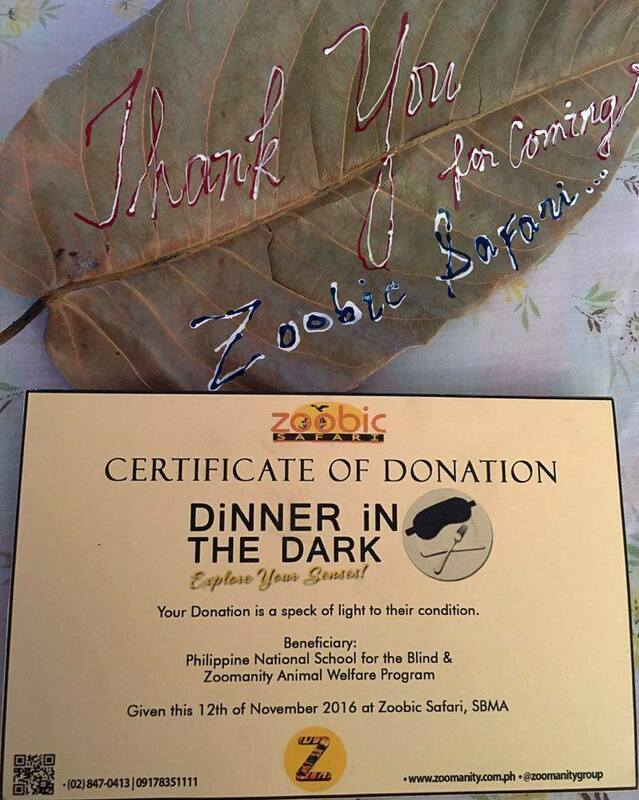 Last November 12, I got the chance to experience Dinner in the Dark of Zoomanity Group at Zoobic Safari, Subic Bay Freeport Zambales. 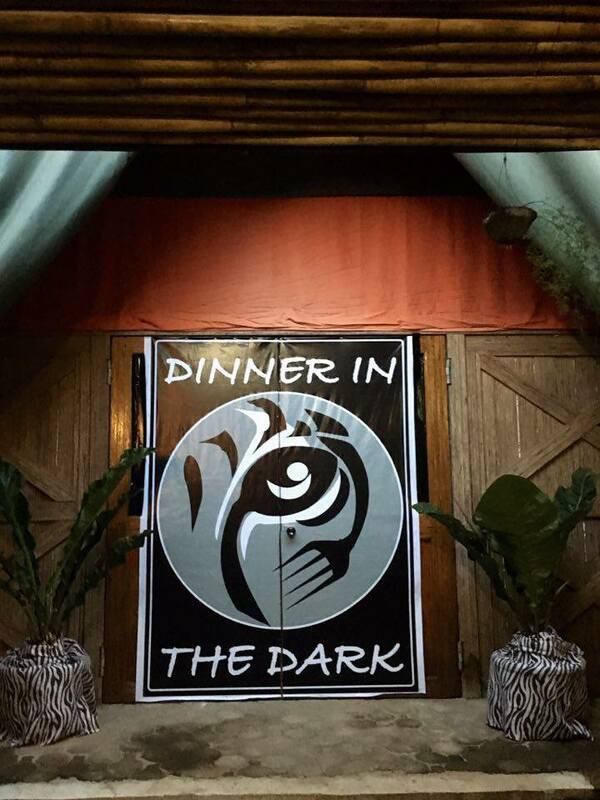 Dinner in the Dark is one of Zoomanity Group's community service that enables its guests to dine and experience the life of visually impaired people. All proceeds from the event will go to our visually impaired brothers and sisters. Before the dinner starts, the guides oriented us of the things that we should expect during the dinner. They also told us that we should not freak out because of the darkness and they assure us that everything will be okay because there are guides to look after us. After the orientation, the guides blindfolded and lined us. While waiting on the line, the darkness little by little sink in my head and I started to worry. 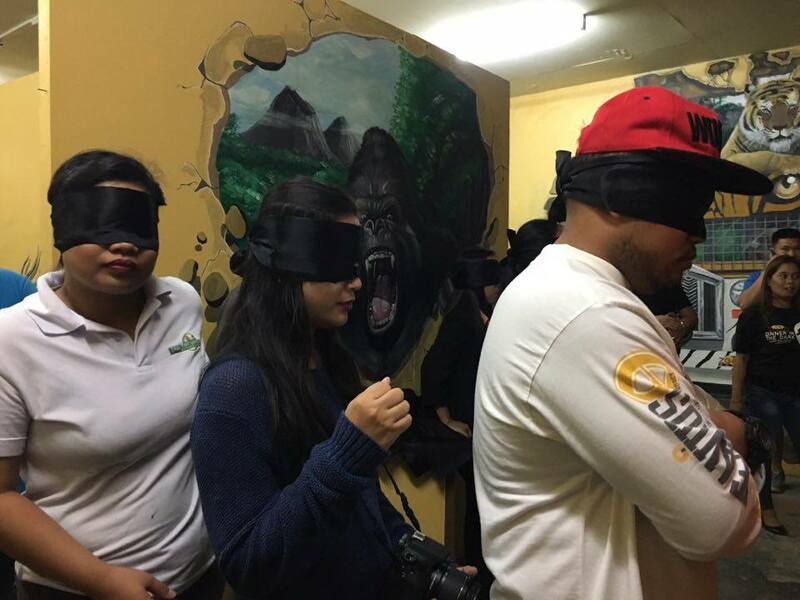 Zoomanity Group staff blindfolded the guest. We started to walk, it was so dark and the only thing that I can rely on are the voice that was leading us to our table. It's not easy to trust someone, especially if you cannot see the person behind the voice that you are hearing, but I am telling you, once you are in that position, you have no choice but to give all your trust to that voice and hope that everything will turn out great. Guests are lined before entering the banquet hall. As soon as we reached our table, I tried to feel everything within my reach. While waiting for everybody to settle, darkness started to scare me again. This time I tried to battle it with happy thoughts but darkness is still everywhere. It usually made me smile whenever I rekindle the faces of my loved ones but this time I can't remember how they look like, all I can see is total darkness, everything is black! I wanted to cry, I felt so helpless and alone. The guide then told us that we can start to eat. She instructed us the food whereabouts by describing the clock movement. I find the instructions hard because I am a visual person, I cannot learn or follow an instruction easily if I cannot see it. The food smells great. The first time I put something in my mouth, I didn't get any. So I tried to use my fork to get something and I succeed. The rice is a bit thick and sticky or "malagkit." The first dish I got is somewhat sweet and delicious and second was a bit salty and tastes like onion. What surprised me while I am eating is that I find the dishes more flavorful than the usual. I also chat with my seatmates and we laugh as we tell each other how hard it is to eat in the dark. Our chit chat got interrupted when one of guide started to talk. We were surprised when he told us that the one guiding us during the entire dining experience is a visually impaired person working in Pampanga. One of them shared their story and I started to feel emotional again. According to the one sharing, he got blind when he was three years old but what I like about him is he is brave enough to go on with his life. Life of a visually impaired person is hard. Everything is painted black, you don't know what lies ahead of you. You don't have a choice but to trust the voices around you and hope that everything will be okay. Zoomanity Group made things lighter by starting a guessing game. They let us guess what we ate. Some got the right answer and some didn't. The sticky rice is paella rice, the dishes were "hardinera" and onion rings with bacon and the dessert is silvana. 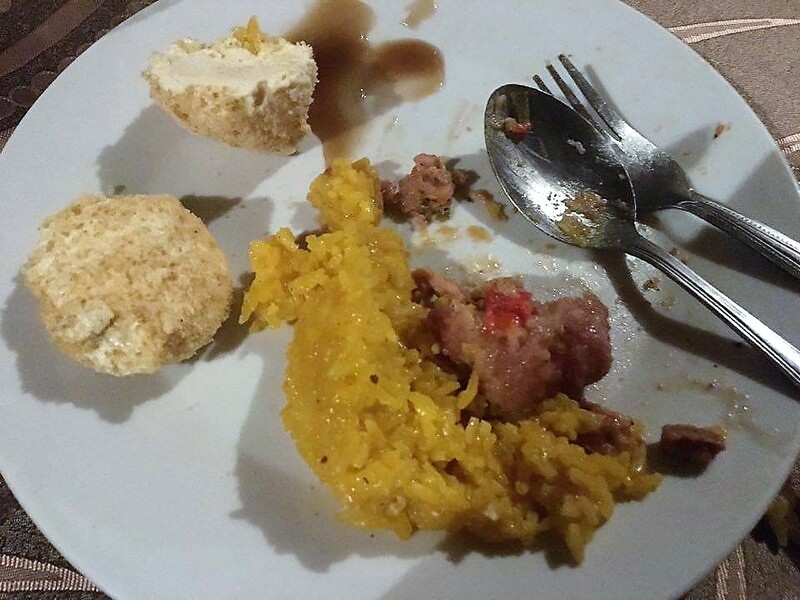 Aside from the guessing game, they also awarded the guests with the cleanest plate. The remnants of my food. They ended the event by finally opening the lights and by giving a token, a plant, and certificate of donation. I am so thankful that Zoomanity Group gave me the chance to experience Dinner in the Dark. Through that experience, I was able to know what it feels like to be visually impaired. For one hour, I felt how hard it is to live in the dark, to trust the people around you even if you don't know if they will help you or not and to be brave even if everything around you is painted black. Aside from this, I was surprised that my sense of smell, taste, and touch are prominent than usual. To experience this emotional encounter you can go to the last Dinner in the Dark this coming December 3, 2016, at Zoomanity Group's Zooper Cruise.